The ornament created with the Steampunk Border Stamp goes to Gez! The ornament created with the Little Church Stamp goes to Jackie! And the ornament created with Roc's Angel Stamp goes to Julie! Congratulations! I want to get these mailed ASAP. So please Gez and Jackie, please provide your mailing address to me via email or private facebook message at your earliest convenience. Julie, I have your address, and I'll let you know when your angel is en route. 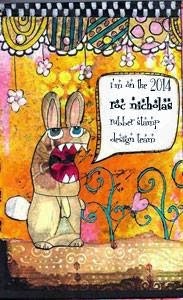 Be sure to check out these stamps, as well as other stamps designed by my friend, Roc, on Stampotique.com. When it comes to creating, the possibilities are endless! oh...congratulations to all the lucky winners! thanks, too, cath, for doing something so awesome with my rubber stamps! i appreciate it so much. julie and jackie, yours are en the mail. gez, waiting for address! !